The Banks-Vernonia State Trail, Oregon's first rail-to-trail, runs through Stub Stewart State Park. We returned from an excellent adventure camping over the long weekend. Banana boats and S'mores were eaten, bugs identified, campfire smoke inhaled, life lived well. We ate hot food, stood around looking at nothing in particular, felt good about being unwashed and messy -- this is the point of camping. 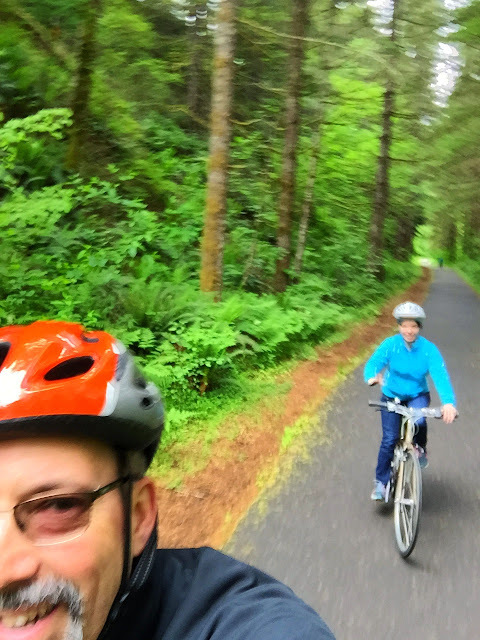 The first day we rode bikes to Vernonia and back, enjoying the thin ribbon of blacktop as it wended its way through the lush forest. The second day we hiked in the hills, sniggering when we went to the Unfit Settlement Viewpoint, our imaginations running wild as to what exactly was so unfit about it. When we were all packed up we discovered the car battery was dead. Lucky for us a neighbor had the gear to start the engine. Showered and back in civilization I can't wait to do it all again.